With more than 400 projects in their portfolio, it can be difficult for the Department of Energy’s SunShot Initiative to adequately convey the scope of the office’s work. The team can list their projects, organize them by program area, and write blog posts about them, but none of that has the same impact as seeing all of the projects displayed on an interactive map. Audiences are now able to click on a map, zoom to different sections and click onto icons to explore the diverse and wonderful world of the SunShot solar energy research and development portfolio. Beyond just showing where projects are, maps are a handy, one-page overview of the scope of work. The Department of Energy is launching maps across its website; the SunShot Initiative chose to host a project map to spur public discussion of its projects and to encourage researchers, entrepreneurs and other solar-interested Americans to participate in helping to solve solar’s unique challenges. The goal of the SunShot Initiative is to make solar energy cost competitive with traditional forms of energy by 2020. The solar industry has already achieved 70% of that goal. But it will take a herculean effort to achieve the remaining 30%, so participation from the nation’s best and brightest is needed. To spur greater public dialogue about the future of solar energy, the SunShot communications team compiled detailed project description pages for every project in its portfolio for inclusion in the map. The active projects in the SunShot portfolio span from awardees that are tackling solar and storage to those creating an incentive program for local communities to go solar. Within the SunShot website, you can find game-changing solar startups, cutting-edge lab research on photovoltaics and leading concentrating solar power projects. These projects are described in detail, with information about how they approach the problem and what innovation they bring to the table. As this information becomes more widely available, the SunShot team is able to encourage better public participation, increase effectiveness and improve the quality of their funding decisions. The more people who know about what the program is working on, the more the team can tap into the broad expertise and knowledge of the American people. Created a content template for project landing pages. This step was key so that we had consistent content and layout across all the pages. We made sure to embed links to higher-level content to allow users to navigate through the hierarchy more easily. Each of the project pages had to be approved by the SunShot project manager. Create a database of projects and decide what information you want to share. This is never as simple as it seems. For example, the SunShot Initiative has many active projects—do we want to show inactive or completed projects? What about the funding amount—do you use the amount awarded (actually received) or what was announced as the project kicked off (Often in the course of a project the scope changes, so the amounts change)? Deciding how you want to navigate all these changes makes an impact on how much information you can include in your database. Meet with developers and lay out the scope and timeline of the project. Allow about three rounds of edits as you discover errors in your database, refine the functionality and adjust the wording and linking of the projects. Launch internally first. You want to make sure your team knows how to use the map and provides input for the second version of the map. We had the developer come into the office, demo the map and take suggestions from the entire office. Iterate. You’re not going to get it perfect the first time. Keep refining your database, adding projects, and re-examining the navigation. Ask your key stakeholders to review the map and suggest changes. The great thing about the map is that it can always be improved. All told, this project took us several months to complete, with the landing pages taking the bulk of the time. Once the project pages were created, the project took about two weeks to complete. Do you have the time? Creating and maintaining this amount of content is very time consuming. Make sure you have the capacity to keep it up to date. Do you have the content? 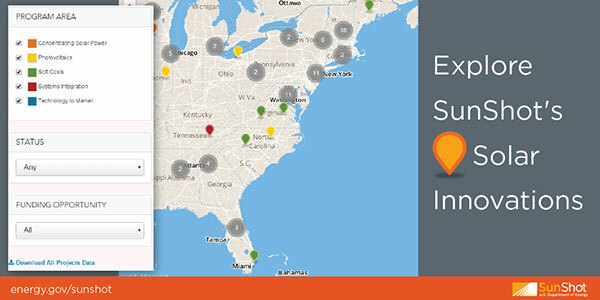 Don’t create a map if your office only supports 10 projects across the country. Do you have the internal support? Without the active participation of all the project managers, the communications team would not have been able to complete this project.